2. 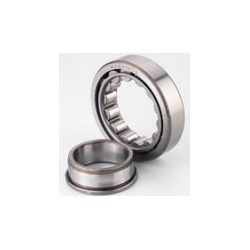 Single row cylindrical roller bearings can accommodate heavy radial loads and high speeds. They are manufactured in several different designs, the main difference being in the configuration of the flanges. The most popular are the NU, N, NJ and NUP designs. 3) Multi-row cylindrical roller bearings, caged. 6) Multi-row full complement cylindrical roller bearings, with four or eight rows of rollers.